At his death in 1551, wealthy merchant Henry Tooley left a large sum to be used to provide relief and accommodation for the poor of Ipswich. In 1569, the foundation set up in his name acquired the former Dominican priory, on what is now Foundation Street, to establish what was effectively the town's first workhouse, which became known as Christ's Hospital. It could accommodate 40 inmates comprising both the 'innocent' poor (the aged, orphaned, widowed and sick), and the 'lazy' poor (vagrants, vagabonds and beggars). In 1574, a major rebuilding took place on the site and workshops were included to provide 40 people with work such as carding, spinning and weaving. Following the passing of the 1601 Poor relief Act, which placed responsibility for relieving the on individual parishes, Christ's Hospital appears to have stopped being a municipal workhouse and instead taken on the role of a charity school for educating poor children. A parliamentary report of 1777 listed a dozen parish workhouses in operation in Ipswich: St Clement (with accommodation for up to 70 inmates), St Helen (10), St Lawrence (25), St Margaret (100), St Mary at Elms (10), St Mary at the Key (25), St Mary Stoke (30), St Mary Tower (30), St Matthew (30), St Nicholas (20), St Peter (28), and St Stephen (24). County of Suffolk: St Clement's (3), St Helen, St Lawrence, St Margaret (3), St Mary-at-Elms, St Mary-at-the-Quay, St Mary Stoke, St Mary-at-the-Town, St Matthew (2), St Nicholas, St Peter (2), St Stephen, Westerfield, Whitton. The population falling within the Union at the 1831 census had been 20,528 — ranging from Whitton (population 346) to St Clement's (4,779). The average annual poor-rate expenditure for the period 1833-35 had been £13,685 or 13s.4d. per head of the population. The new Ipswich Union purchased a 3.5-acre site on Great Whip Street from Christ's Hospital at a cost of £525 for the purpose of erecting a workhouse. Known as St Peter's workhouse, it was erected in 1836-7 at a cost of £6,585 and was intended to accommodate up to 400 inmates. The architect was William Mason who was also responsible for workhouse enlargement schemes at Hartismere and Bury St Edmunds. The Great Whip Street building was constructed in red brick. Its layout broadly followed the popular cruciform or "square" design. Its entrance block on Great Whip Street contained the board room and receiving wards. To the rear, four accommodation wings radiated from a central octagonal hub. The outer perimeter was formed from single-storey workshops and outbuildings. A chapel was later added at the rear of the building and also an infirmary block. The workhouse location and layout are shown on the 1884 map below. Ipswich Great Whip Street workhouse site, 1884. In 1898-9, a new pavilion-plan workhouse and infirmary were erected on a green field site at the south side of Woodbridge Road. Its design was opened to competition and the winning plans were submitted by Stephen Salter and H Percy Adams with Lister Newcombe. Building work began in 1896, the builders George Grimwood & Son having contracted a price of £25,773 for the work. The final cost of the workhouse, which could accommodate 369 inmates, was over £30,000. An architects' drawing shows a bird's-eye view of the site. Ipswich new workhouse and infirmary from the north, 1899. A receiving block at the north-west of the site contained a porter's lodge, receiving wards and tramp cells. A store-room for pauper's clothing was located on the first floor. 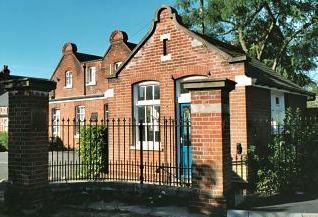 Ipswich entrance lodge from the north-east, 2001. Ipswich reception block from the north-east, 2001. The main workhouse building comprised a central administration block connected by corridors to two-storey wings, that for males to the west, and for females to the east. On the ground floor of each wing were dayrooms, bathrooms, lavatories, dormitories, and bed-sitting rooms for the infirm. On the first floor were dormitories. At the front of the central block were the committee room and master's quarters. To the rear of the central block was a 270-seat dining hall which also served as a chapel. The workhouse infirmary stood at the south of the site. 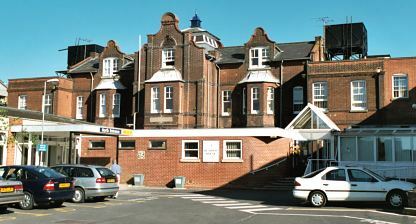 Ipswich infirmary from the south-east, 2001. The site location and layout are shown on the 1903 map below. 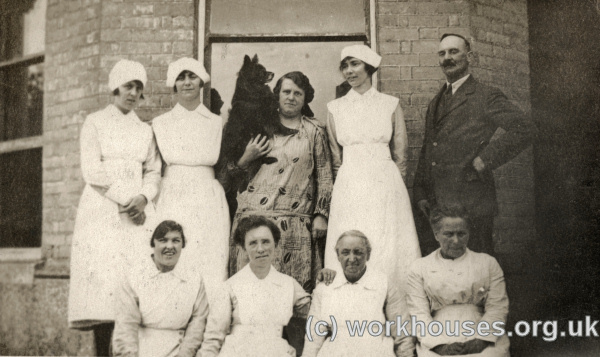 In 1930, the workhouse infirmary became Ipswich Borough General Infirmary, with the workhouse section continuing as Heathfields Public Assistance Institution. 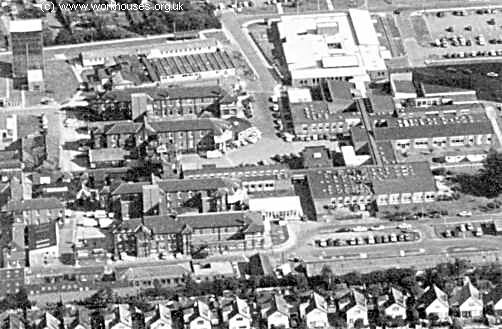 In 1955, the site became the Heath Road Wing of Ipswich General Hospital. The main workhouse building has been demolished but a few of the other blocks survive. Ipswich former entrance site from the west, 1950s. My parents and I moved here sometime in 1937 and remained until 1946 when we moved to Salford. My father was appointed Master of the old workhouse and during the war was also appointed Steward of the hospital with responsibility for lay administrative matters. The hospital had a separate nursing matron. 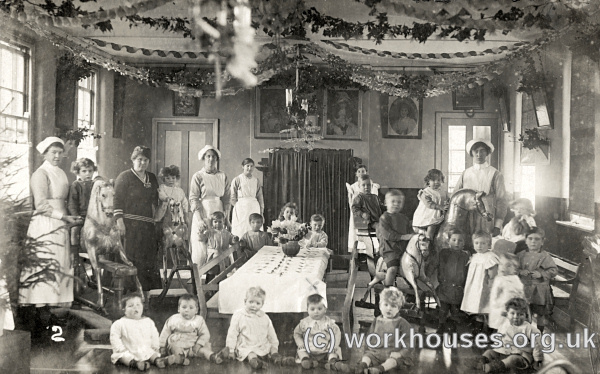 The central block of the workhouse contained a large laundry which catered for both workhouse and infirmary. There was also a large kitchen but I cannot recall whether this served both parts or just the workhouse. The institution also had extensive land to the south of the hospital which comprised a farm, both arable and with livestock (cattle and pigs for certain and there may have been some working horses). There were also orchards. The workhouse had a 'labour yard' under the control of a labour master who oversaw manual work by the able bodied inmates, e.g. sawing logs. 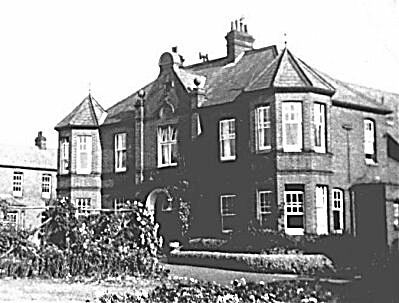 The photograph below is of the front of the workhouse taken by my father in about 1937. Our accommodation comprised the left-hand ground floor and the entire first floor. Heathfields entrance block from the south-east, c.1937. 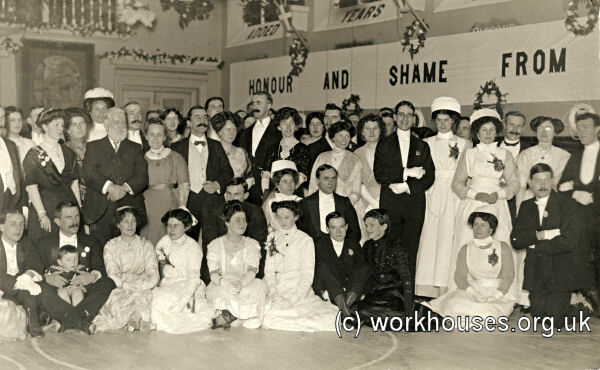 Life at the workhouse was not completely devoid of social events, at least as far as the staff and Guardians were concerned, if the picture below of the 1912 "Workhouse Ball" is anything to go by. The texts adorning the walls, however, seem somewhat at odds with proceedings. 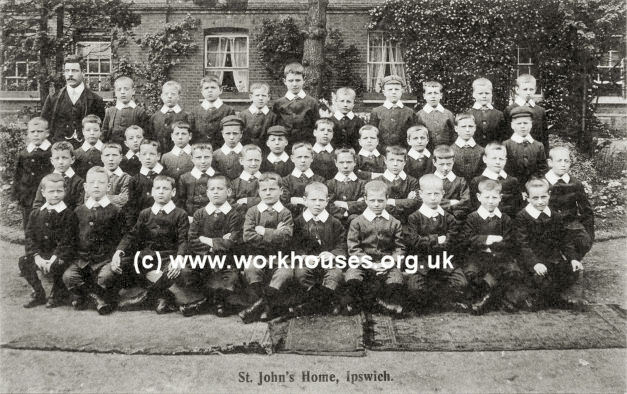 A separate home for pauper children was first proposed by Ipswich Union in around 1870. This was an unusual step for non-metropolitan unions at this time, and may have been the result of space shortage at the Great Whip Street workhouse. Plans were produced in 1871 and 1873 for a long building with a central block flanked by separate wings containing boys' and girls' accommodation. The building, eventually erected at Bloomfield Street in 1879, accommodated 80 boys and 50 girls. The boys were taught to work on the land, and in tailoring, shoe-making and carpentry. The girls were taught needlework and other household skills to equip them for domestic service. A small infirmary was later added. 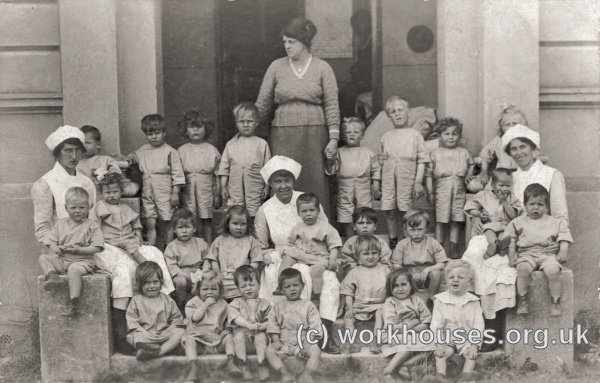 Ipswich St John's Children's Home, 1927. 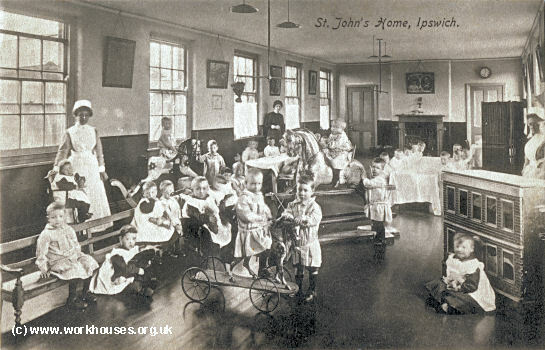 Ipswich St John's Children's Home, c.1910. 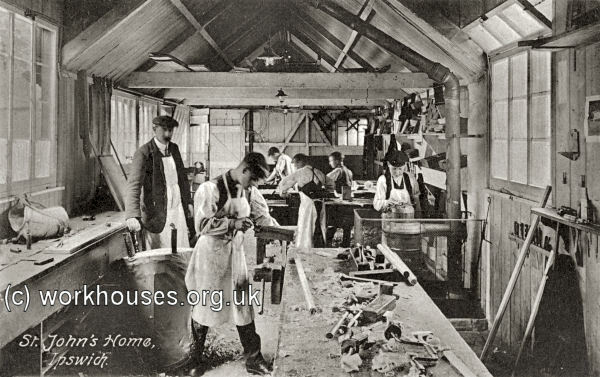 Ipswich St John's Children's Home carpentry workshop, c.1910. 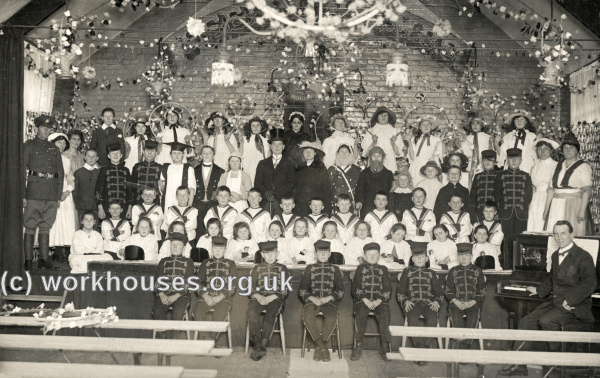 Ipswich St John's Children's Home, early 1900s. The property, later known as Freelands was demolished in the 1970s. The site is now occupied by a housing estate. Suffolk Record Office, Gatacre Road, Ipswich IP1 2LQ. Holdings include: Guardians' minute books (1835-1930); Births (1836-1938); Deaths (1836-1933); Creed registers (1906-50); St John's Children's Home creed registers and record books (1882-1950); etc. Thanks to Peter Collier for his contribution to this page.